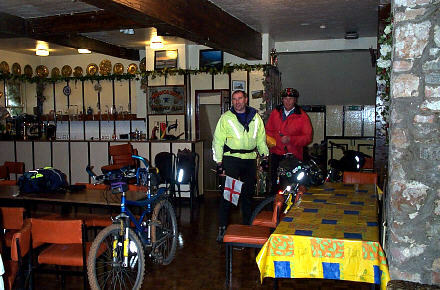 Breakfast in the Red Lion was an experience it got off to a good start when we went down to the Restaurant everything was in darkness, pizza box and half eaten pizza still on the tables. After a few minutes the landlady arrived, half asleep herself, she cleaned away the mess then started to fix breakfast. She brought a teapot and three cups. "I had a stab that you all like tea she says"! Colin usually drinks coffee on a morning but decided tea was fine today. "Do you all want cereal"? she asked. "Yes please" we replied. So she disappeared behind a curtain in the corner of the room and we could hear her shaking boxes and muttering "not much in that one ah! that feels a bit better" until she reappeared with three or four boxes which she threw onto the neighbouring table. "Help yourselves" Then she arrived with 3 platefuls of cooked breakfast, also thrown onto the table. It was not meant badly it was just her waiting on table style. Rough and ready but a good breakfast and well cooked. She was a friendly woman and was interested in what we were doing. We got our gear together and just before 9am we were cycling down Wooler High Street very quiet compared with Saturday night. 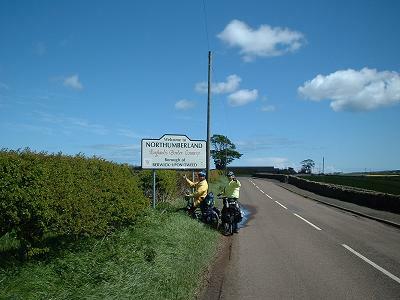 We dropped down onto the flat lands outside Wooler but we had a brisk to strong wind right into our faces, this is going to be in our faces all the way to Berwick. 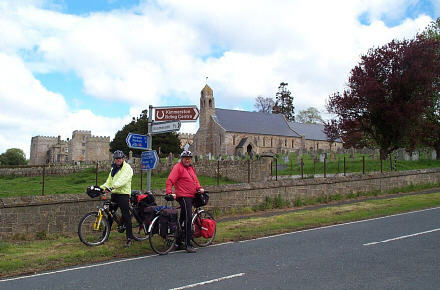 We cycled through flat fields past several quiet villages, Doddington and onto Ford Castle; the roads were very quiet apart from group of horse riders near Ford. We cycled on into the wind it was hard work today. Onto a very pretty village, Etal, nice cricket field thatched cottages and a castle. Then down to the river, Colin and Graeme conned me, made out we had to use a ford to cross the river Till which was flowing fast. I couldn’t believe it and was ready to blow another fuse. I'm not crossing that I will cycle back up the hill and rejoin the road. "Please yourself they said but we are going to use the cycle track over there behind the trees". 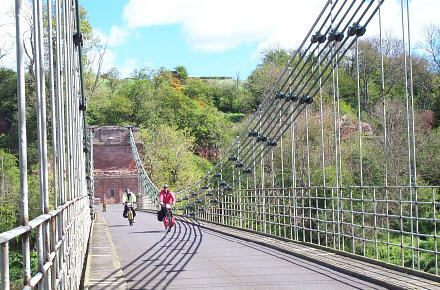 when they pointed out the route running alongside the river, very pretty off road stretch but a climb at the end. We headed towards the Scottish Border at Norham, plan was a tea stop but not one café was open, so we climbed out of the village and had a break sat outside Norham castle. I was done in at this stage but we were on the last stretch. Jill did text me along this stretch which gave me some amusement and took my mind off the pain, the other two for the first time in the ride didn’t hear this text Ha ha ha gotcha boys. then crossed the Tweed into Scotland. 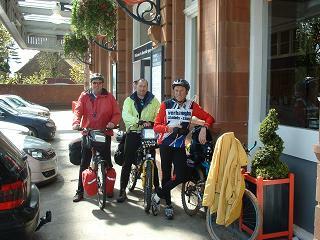 A Great photo we cycled towards Berwick and back into England. A couple of stings in the tail as we climbed up into Berwick, but it was a good feeling to get to the end of another ride, personally for me this was one hard ride. 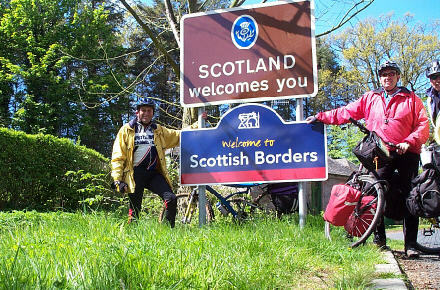 Not far to Berwick and Karen (Colins wife) waiting for us. It was a downhill finish Graeme making sure we all finished together we never ride further than 200 yards apart anyway and always in sight of each other. We all cycled in to the finish together. Berwick railway station not the most auspicious of finishes but we made it the end of another great ride, a very hard one too, the weather against us the bikes breaking down, well mainly mine as usual. Karen was at the Station to meet us and after a couple of photos we had to get down to loading all our gear and the bikes onto the rack and into Colin’s Golf. We made it as usual. We drove into Berwick and threw the pebbles we had carried from Arnside into the Tweed. Another Coast to Coast completed, the Multidaymen way. It was now the drive home via Kendal to drop Graeme off and collect my car and what bits of bike were left. It as a pleasant ride home with a stop in Newcastle for a MacDonald’s and then on our way to Kendal. A total of 215 miles ridden over some pretty hilly terrain, yes this ride is challenging. Next year C to D mmmmmmmm let’s talk about this one, Cornhill on Tweed to Durham probably? We are going to chop off the country in stages.